Garden Figments 'The Online Garden Design Shop' are happy to present the fantastic Forest Arden Gazebo. With so many on offer right now, it is wise to have a make you can recognise. 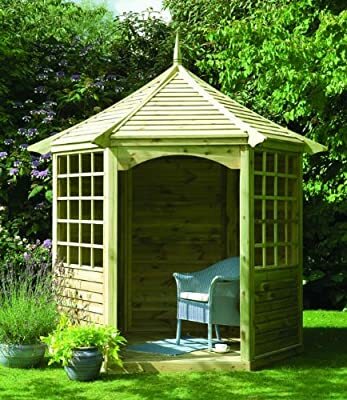 The Forest Arden Gazebo is certainly that and will be a great buy. For this great price, the Forest Arden Gazebo comes widely respected and is a regular choice for many people. FOREST have provided some great touches and this equals good value for money. The ARDEN GAZEBO would be a gorgeous enhancement to your outdoor area providing a beautiful retreat to spend quiet moments taking in the fresh air. It includes three benches perfect for relaxing in contentment whilst gazing out into the back garden. Its traditional style in lovely, natural timber ensures it will look amazing and blend beautifully with your existing decor. The ARDEN GAZEBO offers nearly complete privacy and protection on all sides from sun, rain, or wind with only its front being open and an entirely closed back. Its angled roof is effective at draining off rain water to prevent damage. The ARDEN GAZEBO measures 300 x 282 x 246cm for a spacious and comfortable interior. The timber has been pressure-treated for ultimate strength and durability in the face of inclement weather. The ARDEN GAZEBO will arrive flat-packed with fixings and comprehensive instruction manual to guide you smoothly through setup, so you and yours can begin to enjoy the new gazebo in no time. At ‘Garden Figments’ we handpick all our gazeboes so you have the best selection of items at affordable prices. We use Amazon.co.uk to fulfil and ship all our gazeboes in our Online Garden Shop. This means that you can shop with confidence knowing that your items will be supplied using Amazon's top quality shipping service, secure payment processing, first rate customer service and online order tracking. Also every order is covered by Amazon’s 30 day money back guarantee.